My Grandpa applied and was accepted. He spent the duration of his time in the service at Colorado College completing his Officer’s training and playing football for the school team. Before he finished his training the war ended so my Grandpa never saw combat. I am proud to descend from someone who took the bull by the horns. He didn’t wait around for something to happen to him, he dove in. He chose the Marine Corps because so many boys were dying in the Army. And he didn’t let people tell him what he was or was not capable of, he went ahead and worked for what he wanted. I think he was very brave. Despite his bravery and acceptance of the inevitable, I am also grateful that he was spared combat. This photo was taken during his years serving in the Marine Corps. It is such a treasure to me. My Grandpa was given a very short, 48 hour leave. He hitchhiked and rode a bus to get back home unannounced. He was home for an hour or two – just long enough to see his family and his girl – before he had to turn around and head back to Colorado. It would be five years before my grandparents married. 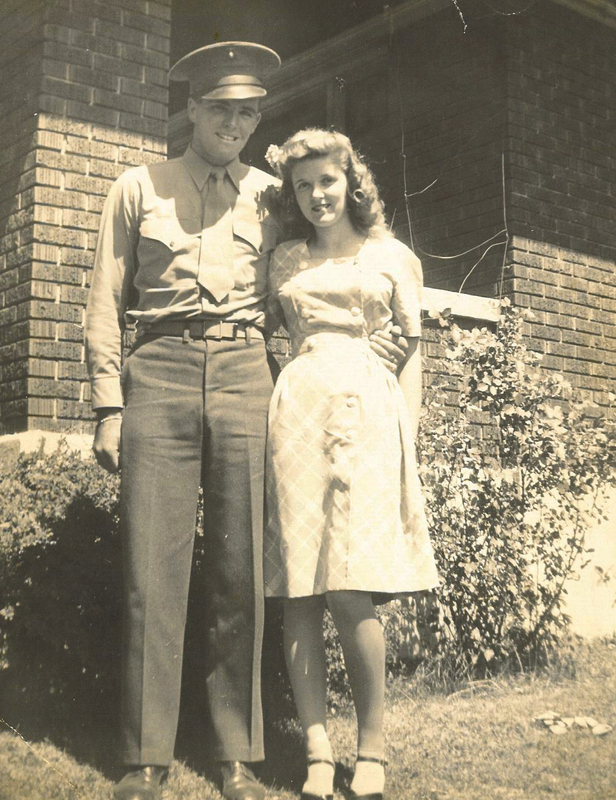 After his discharge from the military he served a 2 1/2 year LDS mission to New Zealand. It was upon his return that they were finally wed. This Memorial Day I am thinking of my Grandpa. I am thinking of my Grandpa and all of the other young men who were in his shoes. They knew they were going to be called up and so many of them chose to enlist. They were sent all over the world to fight in a terrible war. A war that claimed far too many. A war that saved so many. Today, I honor their sacrifice and willingness to serve. Today, I remember that my freedom was paid for time and again by others. Today, I am grateful. Wonderful Memorial Day tribute to your handsome grandfather! Thank you Maryann, he was pretty handsome wasn’t he?